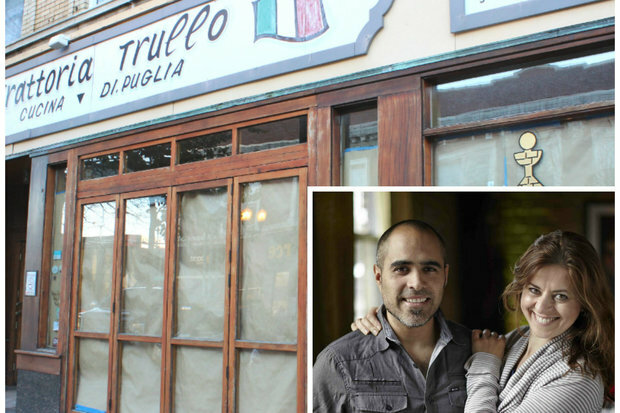 Husband-and-wife owners Maria Alferov and Sebastian Casanova are aiming for an early 2016 opening of Artango Bistro in the former Trattoria Trullo storefront. LINCOLN SQUARE — Get ready to put on your dancing shoes, Lincoln Square — Artango Bistro is coming to the storefront formerly occupied by Trattoria Trullo. The restaurant/dance center is moving from its current digs at 4217 N. Ravenswood Ave. to the heart of Lincoln Square at 4767 N. Lincoln Ave.
Husband-and-wife owners Maria Alferov and Sebastian Casanova are aiming for an early 2016 opening, according to a spokesman for the couple. Alferov opened Artango Center in 2008 strictly as a dance studio focused on Argentine tango. She met Casanova, a Buenos Aires-born artist, in 2009 when he signed up for tango lessons. They married in 2010 and teamed up on Artango Bistro in 2013, a combined dining and dancing concept that quickly became a date-night favorite. The bistro's cuisine draws inspiration from Argentine, Venezuelan and Peruvian classics. Patrons can take advantage of free tango lessons with their dinner every Tuesday, Wednesday and Thursday night, as well as a $40 prix fixe menu. With the move to Lincoln Avenue, Artango not only gains increased visibility but also significantly more square footage — an increase from 80 seats to 180, according to the spokesman. Trattoria Trullo closed in March after a rent dispute.